The Family Hub is a revolutionary new refrigerator with a Wifi enabled touchscreen that lets you manage your groceries, connect with your family and entertain like never before. 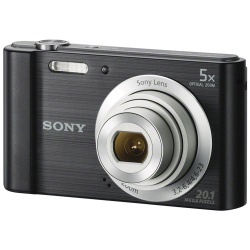 Always know what's inside with built-in cameras. Easily monitor and order groceries. Or simply discover recipes. The Family Hub's 3 built-in cameras will let you see what’s inside, so you can check what you have left from your phone whenever you’re out. So even when you’re shopping, you can take a quick look. Choose to track your key fridge items and their expiry dates.Set reminders which will appear on the fridge’s screen and on your mobile, so you can enjoy your food at its best. With the Whisk App, you can organise your inspiration. Plan smarter. Shop where and how you want. All from the Family Hub touchscreen or your smartphone. Use one personalisable calendar for the whole family to easily keep on top of everyone’s schedules. Add reminders and notes or simply share pictures you like. The Family Hub is so much more than a refrigerator. While keeping your food at its freshest, it also brings kitchen entertainment to a new level, whether you want to continue watching that programme of yours or you prefer listening to music. Discover a more realistic TV watching experience with the Sony BRAVIA KD55AF8BU 55" Smart 4K Ultra HD HDR OLED TV. With 8 million OLED pixels and 4K HDR picture, you'll be able to enjoy all your favourite shows and movies in a more immersive way than ever before. Featuring the X1 Extreme processor, you'll get perfect blur-free images even during dark scenes, so you'll never miss a moment of the action. Colours are also brighter and more vivid, so whether you're watching a wildlife documentary, the latest blockbuster, or your favourite soap, you'll benefit from better clarity and enhanced realism. With a wider than average viewing angle, everyone in the room can have the best seat in the house, even if they're sitting off-centre. Get immersed in your movie without any distracting clutter around your TV. Thanks to the acoustic surface - specially designed actuators vibrate the TV panel to create perfect sound straight from your screen – there will be nothing to distract you from the image in front of you. Bring a whole world of content directly to your TV without having to tether your laptop. Forget about being tied down with wires and cables, and get instant access to your favourite shows, app, games, Netflix and more. Whether you're finding something to keep the kids entertained or you want to try the new show everyone's talking about, you can find whatever you're looking for in moments. The BRAVIA AF8 comes with a voice remote, so it couldn't be easier to search for shows and movies – just press the mic button and tell Android TV what you want to watch. No more wasting time tediously typing on your TV remote. It's also compatible with Alexa, which makes it even easier to control your TV. Simply talk to your Amazon Alexa speaker to control your TV with your voice. It has Chromecast built-in, so if you're watching something on your phone, it's easy to send it straight to your screen for the whole family to enjoy. Feel more immersed in your entertainment than ever with stunning Dolby Atmos sound. 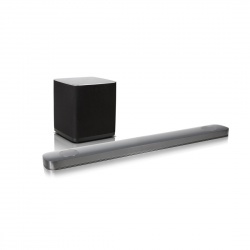 The flagship LG SJ9 5.1 Wireless Sound Bar features 10 speakers to create a realistic object-based 3D audio field. Upward-firing speakers make sounds appear above you so you feel like you're surrounded by audio – just like being at the movies. The sound bar supports High Resolution Audio, letting you hear more of your music than with other digital formats. Experience 24-bit/192 kHz quality through high-quality components for premium sound as the artist intended – sometimes in better than CD quality. With two up-firing speakers and a unique driver configuration, the LG SJ9 creates the full Dolby Atmos experience. Hear music and soundtracks in exciting new ways that elevate your entertainment above the ordinary. You can connect 4K sources like your Ultra HD Blu-ray player and 4K TV to the sound bar with a single cable without affecting picture or sound quality. Enjoy a full Ultra HD experience to elevate your entertainment. Complement your 55” LG TV with the SJ9's premium gun metal grey metallic design. 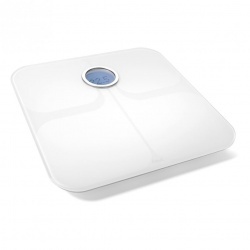 It's a minimalist look that adds tasteful style to your living room. The sound bar is wall-mountable, helping you save space and create a unique visual accent. Or just lay it neatly under your TV. The LG SJ9 Sound Bar is part of the LG Smart WiFi Sound system multi-room range. This means you can wirelessly connect it with compatible LG smart sound speakers like the H7, H5, H4 and H3 to play audio in every room. Using the LG App, control your speakers to have the same song everywhere or a different soundtrack in each room. Playback is easy. Sync your smart devices using WiFi and Bluetooth to play back content from services like YouTube, Google Cast and more. You can literally swipe your sound bar to enhance the way you listen. Connect to your Blu-ray player, TV or games console with two HDMI 2.0 ports. A USB input lets you play back music from USB drives and devices. If you've got a compatible LG TV, you can wirelessly sync the SJ9with it. This means less cabling clutter and freer placement, so you can create the AV setup you want. Check out our range of HDMI and optical cables to connect your input devices and to make sure your new sound bar works perfectly, with improved transfer speeds. Look out for the Sandstrom Silver Series HDMI cables with their lifetime warranty. 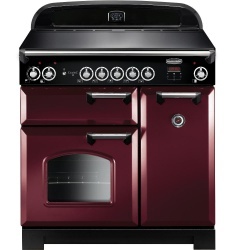 With bevelled doors, elegant windows and sturdy handles, Rangemaster's Classic offers everything you’d expect and more from a traditional range cooker. Combining timeless, chic styling with a distinctly practical purpose, this luxury appliance features an induction hob with 5 zones and hot hob indicators. Induction cooking gives near-instant heat and allows you to precisely control the temperature at which you cook. As only the area at the base of your cookware is heated, it's also highly energy efficient. Both ovens are fan powered and have a large capacity that's perfect for catering for friends and family. A programmable clock and minute minder are also on hand for extra convenience, while Rangemaster’s handyrack provides easy access to joints of meat or larger trays. There's a separate dual circuit grill that glides out on runners for additional ease, and a plate warming rack in the taller oven. The cooker is even height adjustable and boasts catalytic stay-clean liners that make cleaning a breeze. 3 Dyson tools for cleaning dust and dirt from hard-to-reach places. Carefully selected cleaning tool combinations. Dyson tools and accessories are conceived and engineered at Dyson's Research, Design and Development centre. 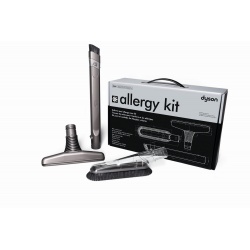 They're made from the same tough materials as Dyson vacuums - glass-welded polypropylene and ABS polycarbonate. Every angle and dimension is carefully considered to ensure that the tool is fit for purpose. Soft bristles gently remove dust and allergens from flat surfaces and furniture. Extends and flexes into awkward gaps. Ideal for cleaning between seats, or door pockets. 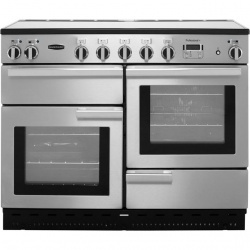 Put the joy back into cooking with this fantastic stainless steel electric range cooker from Rangemaster. Its 4 cavities include 2 ovens, a grill and a storage compartment, so you’ll even have room to organise your baking trays. When you’re experimenting with indulgent dessert recipes, the main fan oven is ideal as heat circulates evenly throughout, leaving everything thoroughly cooked on each shelf. There’s a second conventional oven too, which is great for Sunday dinner as heat rises inside, letting you roast meat at the top where it’s hotter, while baking apple crumble underneath. You can boil and fry more efficiently as well, because the 5 zone induction hob uses electromagnets to directly heat the base of your pans, rather than the whole hob surface. Features ‘hot hob’ indicators for safety. Induction cooking saves time and energy as only the base of the pan is heated, great if you are conscious about your energy consumption. 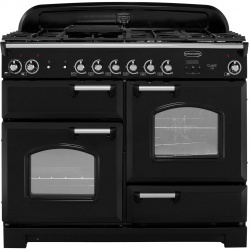 This range cooker also comes with a two year parts and labour warranty, for added peace of mind. The Rangemaster LEIHDC110BB Chimney Cooker Hood is a smart and efficient solution to keep kitchen odours at bay during cooking. With three powerful fan settings and the ability to use it as either a ducted or re-circulatory system, the 110 cm wide LEIHDC110BB offers maximum extraction rates of up to 530 cubic metres per hour, and comes with both a washable metal grease filter and odour-neutralizing charcoal filters. Two in-built halogen lamps provide more visibility for when you're cooking on the hob. Keep your kitchen fresh and fume free with the striking and effective Rangemaster LEIHDC110BB Chimney Cooker Hood in black – the ideal match for your 110 cm Rangemaster cooker. Style-wise it offers everything a traditional range cooker should – bevelled doors, arched windows, handy towel rail and a chrome trim. This model comes with a Handyrack, which is similar to Rangemaster's Handygrill and attaches to the main oven door so you can pull the roasting tray out with ease and safety. You’ll also benefit from a storage drawer for baking trays (110cm) and programmable oven, which gives you the freedom to start and finish cooking a dish while you are out – the best welcome home you could wish for. It’s also A rated for energy efficiency. Positioned on smooth-action telescopic runners, Rangemaster’s glide-out grill™ does exactly that. Not only is it easier to check up on your food as it’s grilling, but it’s also safer as it reduces the risk of pulling the grill out too far. Made from robust cast aluminium, the griddle plate sits snugly on top of the gas hob, when required. 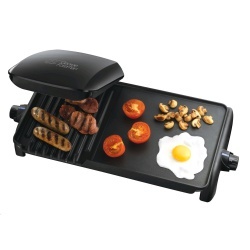 The flat plate is suitable for cooking bacon and French toast, while the grooved plate provides fat drainage, offering a healthier way to sear steaks, burgers and fish. With a main fan oven of 73L (80L conventional), the Rangemaster oven leads the way for size and performance. 'A' rated across the board and ultra fast pre-heating with Rapid Response™ make Rangemaster ovens the largest and most efficient available. Create authentic Asian cuisine on Rangemaster’s multi-ring burner, which can hold a specially designed wok cradle. 7 Wonders of RangemasterEach cooker has a Tri-tonne™ frame, Multi-glaze™ oven door, EasyCook™ controls, Cookmax XL™ ovens, Spill-guard™ hotplates and Endurance™ finish, all checked and tested prior to delivery.